Like French and German armies caught in the terrible Russian winter, the GOP is about to suffer from the consequences of missing deadlines. 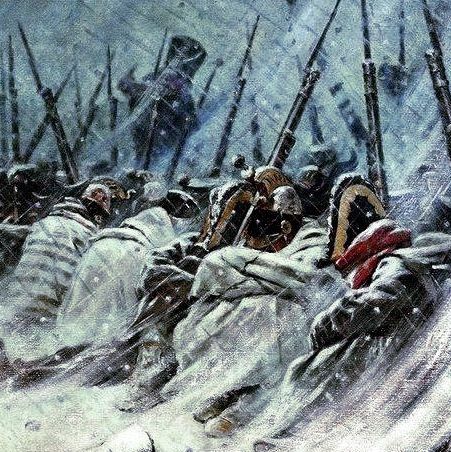 Illustration: Vasily Vereshchagin, The Night Bivouac of the Napoleon Army during retreat from Russia in 1812. Oil on canvas. Historical Museum, Moscow, Russia. After Republicans won their total victory last November, many observers —including yours truly — envisioned a 2017 legislative blitzkrieg that would enact many long-standing conservative priorities blocked, for ten years, by congressional Democrats and/or by Barack Obama. As in the highly motorized military tactic that gave rise to the term blitzkrieg, speed, coordination, and concentration of force at the enemy’s most vulnerable point were deemed critical to Republican hopes for a big year. That’s why the linchpin of every GOP plan was the budget-reconciliation process that provided for fast-track procedures and ruled out a Democratic filibuster. If only Paul Ryan, Mitch McConnell, and Donald Trump could get on the same page, it could all happen before opponents could fully get their act together to plan and execute a resistance. But now it’s all gone horribly wrong, and Republicans are looking at a delayed timetable that could add to their misery — suddenly they are mired in a legislative Russian winter after assuming they could claim a quick victory before the snow started falling. Enzi said the first reconciliation bill would be used to repeal Obamacare and could be sent to President-elect Donald Trump’s desk soon after he takes office. The bill would be tied to a budget resolution for fiscal 2017, which Congress never passed this year, and then they would deal with tax reform in a second bill. Now, as Memorial Day approaches, the first step in the master plan is grievously overdue. The reality of what would happen to health coverage in the country kept Republicans from enacting a simple Obamacare repeal (as they had done a year earlier in a bill they knew Obama would veto), and then the backup “repeal and delay” approach that kept the current system in place for years fell apart as well, particularly when Donald Trump attacked it in a press conference shortly before his inauguration. And so began the saga of the American Health Care Act, which after constant delays and terrible public perception limped over its first and easiest hurdle last week, more than three months late. The one thing we know infallibly about Senate action on repealing and replacing Obamacare is that the upper chamber is not about to rubber-stamp AHCA. Indeed, it will not even begin its deliberations until the Congressional Budget Office “scores” the House-passed bill, quite possibly burying it forever in a wave of national revulsion if the coverage and cost numbers come in levels near or worse than those of the original bill. So the Senate will likely start all over, probably not until June, and then if it overcomes its own highly complicated internal GOP problems with passing anything, it will have to conduct negotiations with the House and produce a compromise which can somehow clear both chambers. So, as Axios calculates, the “health reform” bill that was supposed to be ready for Donald Trump to sign shortly after he took the oath of office (the original deadline was January 27) now won’t make it to his desk until this autumn, if it makes it out of Congress at all, which remains a very dicey proposition. And until it’s done or is discarded, Congress cannot even begin putting together a reconciliation bill to authorize tax reforms. So that must-pass priority for 2017 is increasingly looking like it will slip into the perilous landscape of a midterm election year. Though Congress avoided a government closure this month — a major bipartisan legislative accomplishment for an institution otherwise devoid of any this year — a quintet of critical deadlines in the early fall will force either a furious round of deal-making or brinkmanship that could have dire effects on the economy. It will be a major test of Trump and the all-GOP Congress’ ability to govern, who are bound to be blamed for any problems given their dominant political position. The “quintet” includes government funding beyond the current September 30 expiration date for the stopgap bill enacted last week, with work just now beginning on 12 appropriations bills; a debt-limit increase; and reauthorization of the Children’s Health Care Program, the Federal Aviation Administration, and federal flood insurance programs. Any of these five legislative priorities could attract “poison pill” provisions and help trigger Democratic Senate filibusters, a deadlock, and eventually a government shutdown (of the sort Trump seemed to actually endorse last week). That list doesn’t even include Trump’s much-discussed infrastructure initiative and the possibility of some foreign policy crisis with legislative implications (e.g., a greater commitment to action in Syria). Even if Congress and the administration can successfully get around some of these land mines, the odds of at least one of them blowing things up makes the rest of 2017 look like a gauntlet — far from the high-speed political revolution Republicans imagined last November 9. And every time another deadline slips or another goal is abandoned, the strains on Republican unity increase. Republicans better savor the feeling of that laughably premature Rose Garden gathering last Friday, celebrating the first small step forward toward a health-care bill. It may be a very cold day in hell — or Washington — before their next opportunity to party.